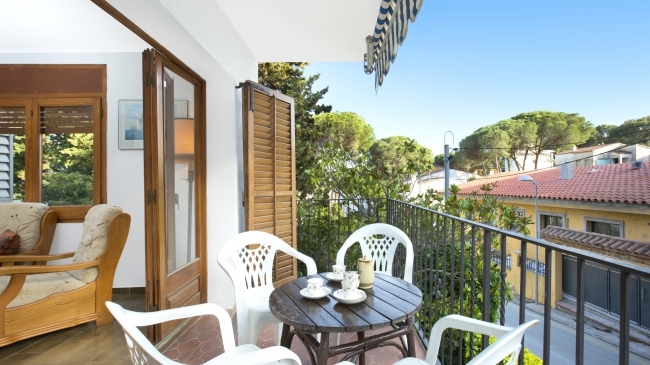 Villa with pool located 5km from the beach of Lloret de Mar in a quiet area. It has 4 bedrooms (2 with double bed, 1 with 2 single beds and 1 with 1 single bed, a bathroom with shower, kitchen (ceramic hob, microwave, oven, dishwasher), living-dining room with terrace exit. Swimming pool with large terrace and barbecue area. Outside parking 1 car. Optional Wifi: 50 euros/week. 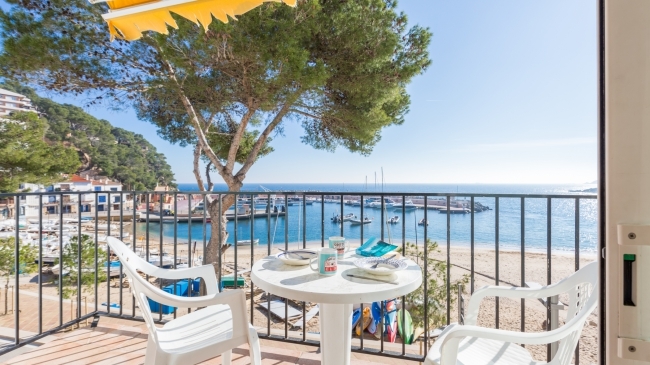 Apartment duplex distributed in 2 independent floors located in Llafranc, just 200m from the beach and the center. The first floor is completely renovated and consists of an open kitchen (ceramic hob, oven, microwave, dishwasher) to the living room (TV, small terrace with outdoor furniture), 3 double bedrooms (1 with double bed (135x190cm), 4 beds individual (90x190cm)) and 1 full bathroom with shower. To access the upper floor, there are stairs located on the outside of the house. On this floor we find 2 double bedrooms (1 double bed (135x190cm), 2 single beds (80x180cm)) and 1 bathroom with shower. Terrace furnished. Optional heating (march, april, may) 30 euros/week. Beautiful modern house with pool and stunning sea views located in Serra Brava 3 km from the beach of Canyelles and 5 km from Lloret de Mar. Upstairs are 3 bedrooms (1 bedroom with triple pull-out bed, 1 bedroom with 2 single beds, 1 bedroom with parental bed with balcony exit) and a bathroom with bath. On the ground floor is the living-dining room with exit to the garden and pool, a kitchen (ceramic hob, oven, microwave, dishwasher) and a bathroom with shower. Magnificent outdoor area with chill out and infinity pool overlooking the bay of Lloret de Mar. Barbecue, wifi, satellite, parking 2 cars. No pets allowed.